“Deep Breath”. Is it a title? Or a statement of intent? Armed with “attack eyebrows” and a taste for the grisly, the Peter Capaldi era arrives with a tale that delivers a literal change of pace for Doctor Who, trading the giddy, pirouetting, breathless energy of Matt Smith for something slower, darker, altogether more considered – a tumbler of fine Scots whisky in place of a long, tall glass of pop. Not that you’d know it from the opening scene. A marauding T-Rex spitting the TARDIS past Big Ben is the kind of deranged visual you once imagined could never exist outside of a Doctor Who Weekly comic strip. And now here it is, delivering the new Doctor into the heart of Saturday night event television. Score one for unfettered imagination. Special guest helmer Ben Wheatley studs “Deep Breath” with moments of equal pulp poetry: a dinosaur in flames against a Victorian skyline; the lamp-lit figure of a steampunk Jack the Ripper; a restaurant populated by clockwork patrons, betrayed by their malevolent whirrs and clicks… It’s a less idiosyncratic offering than you may have expected from the director of A Field In England but, loyally keeping within the lines of the BBC Wales house style, Wheatley does Doctor Who very well indeed. It’s an episode that’s not shy about its influences. The script tells us it’s “Sweeney Todd without the pies” seconds after we’ve made the same connection. “Burke and Hare from space,” adds Clara, stealing smart lines before reviewers can write them. More crucially, the Doctor disarms any snark that this story’s simply recycling the threat from “The Girl In The Fireplace” with the knowing aside “Droids harvesting spare parts, that rings a bell!” The droids of the SS Marie Antoinette don’t quite have the iconic shiver of their Venetian-masked counterparts – the “Fireplace” originals felt genuinely torn from a child’s nightmares while these have the agreeable shudder of the Chamber of Horrors – but they’re a good, fresh spin on the concept. There’s a marvelously creepy blankness to Peter Ferdinando’s Half-Faced Man, all broken fairground menace. There’s a sense in which this feels like a restatement for Doctor Who, a return to earlier principles, to the dark teatime shudder of the early Tom Baker era. The gaslit Victoriana helps, of course – hello, “The Talons Of Weng-Chiang” – but there’s a newfound edge to the threat, a blood and thunder sincerity powering this ripping yarn. It dials down the glib, as Steven Moffat promised. It’s especially startling to see the Half-Faced Man threaten Clara with a blowtorch hand. Elsewhere Wheatley lingers on the gruesome, focusing on a corpse’s slimy eyeball as if baiting the vigilant ghost of Mary Whitehouse. 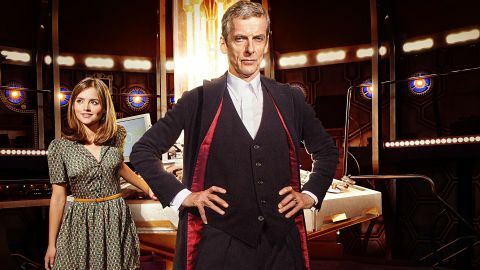 Above all Peter Capaldi’s first episode fights tirelessly to convince a 21st century audience that a craggy fiftysomething with the look of a Presbyterian minister is as much the Doctor as the cheeky, telegenic boys that preceded him. Matt Smith’s debut in “The Eleventh Hour” was an A-bomb of charm exploding in your general direction; this one’s more of a stealth campaign, acknowledging modern expectations of who the Doctor should be – as well as wider expectations of prime time Saturday night stardom – and quietly rewiring them. “Why’s it got lines on it?” asks Clara of the Time Lord’s new face, and even the Eleventh Doctor shudders at the prospect (“Tell me I didn’t get old, anything but old…”). The Matt Smith cameo is touching but ultimately unnecessary, a reassurance too far, perhaps: belt, braces and bow-tie. So what are we to make of this new Doctor? It’s a compelling, surprising, wonderfully dangerous debut. Sure, there are familiar echoes – Capaldi fixes Strax with a loon stare worthy of Tom Baker and handles the post-regenerative comedy schtick superbly (“Who invented this room?”). But there are strange new flavours, too. A fire in that tightly coiled grasshopper body with its lean, expressive hands. “You’re out of your depth, son,” he tells a droid, with the simmer of a Glasgow hard man. Soon after he pours a glass and says “I have a horrible feeling I’m about to kill you. I thought you’d appreciate a drink first. I know I would.” It feels like Daniel Craig’s Bond at his darkest, or Edward Woodward’s turn as the melancholy assassin in Callan. This is a Doctor who can disturb us. Most telling of all is the moment the Twelfth watches his enemy perish. Capaldi’s eyelids flicker then snap wide, startling but inscrutable. It’s then that you realise, with a jolt, that you have absolutely no idea what the Doctor is thinking. And that’s new and unnerving. I missed the semi-traditional scene of the Doctor rummaging through the TARDIS dressing-up box, choosing an identity. But then this dark, dapper Doctor seems to know exactly who he is. Clearly it’s up to the rest of us to catch up. All eyes are on Capaldi, of course, but “Deep Breath” may just be Jenna Coleman’s finest moment in Doctor Who. It helps that Clara’s written as a stronger, truer character here – heroically calling her captor’s bluff while admitting that yes, she’s crying; holding her breath as she walks past the waiting droids; dealing with the Doctor’s change of face – and Coleman leaps on this meatier characterisation to make Clara feel brave and real. She also proves to have a great comic chemistry with Capaldi. Just watch them in the restaurant scene, trading barbs and exasperation, perfectly in synch with the funny. There are times, too, when she seems to be the utter reincarnation of Sarah Jane Smith. “Where did he get that face?” While other Doctor debuts have launched their rebooted heroes with a minimum of awkward questions, “Deep Breath” frets over the finer details of the regeneration process. “I never know where the faces come from,” the Doctor tells us, rather spoiling the fan theory that the Fifth Doctor opted for Colin Baker’s physog after seeing Commander Maxil modelling it in “Arc Of Infinity” (Romana, of course, had absolute mastery over the process in “Destiny Of The Daleks”, rummaging through new bodies like a crazed fashion spree in the DNA department of Primark). It also addresses how some of the Doctor’s earlier faces had a tendency to arrive pre-loved: “It’s covered in lines, but I didn’t do the frowning…” We’ve now seen Peter Capaldi play three distinctly different characters in the Whoniverse. Clearly this is a mystery being seeded. The new title sequence is inspired by a proof-of-concept created by Billy Hanshaw and uploaded to YouTube last year. It retains the clock motif – fitting that it’s introduced in a story about a clockwork menace – but adds significantly more attack eyebrows. The tramp is played by Brian Miller, the widower of Elisabeth Sladen. He’s been in Doctor Who before – he was Dugdale in 1983’s “Snakedance” and voiced a Dalek in 1988’s “Remembrance Of The Daleks”. “The game is afoot,” declares Vastra, quoting Sherlock Holmes – or possibly inspiring him, if the events of “The Snowmen” are to be believed – but that’s not the only nod to Baker Street’s finest smuggled into this episode. “Deep Breath” also homages two of Conan Doyle’s intriguing hints at untold adventures in the Holmes canon: the Camberwell poisoning case (mentioned in “The Adventure Of The Five Orange Pips”) and the Conk-Singleton forgery case (from “The Adventure Of The Five Orange Pips”). The Paternoster Irregulars, meanwhile, are clearly a close relation of the Baker Street Irregulars, Holmes’ army of inquisitive street scruffs. “You’ve redcorated… I don’t like it,” says Clara, riffing on a line made famous by Patrick Troughton in “The Three Doctors” and “The Five Doctors” and resurrected by David Tennant in “The Day Of The Doctor”. Personally I do like the bibliophile makeover for the console room – you can always judge a man by the state of his shelves. Yet another piece of self-referentiality from the Moffat keyboard: Vastra says “Well, here we go again,” the very words used by the Brigadier as Jon Pertwee swapped mighty conks with Tom Baker in “Planet Of The Spiders”. Doctor Who is on Saturdays on BBC One.